Add markup to your product pages so Google can provide detailed product information in rich Search results — including Google Images. Users can see price, availability, and review ratings right on Search results. Using markup to enable rich product results lets you attract potential buyers while they are searching for items to buy on Google or images that include products you sell. Maintain the accuracy and freshness of your product information, so your customers find the relevant, current items they're looking for. 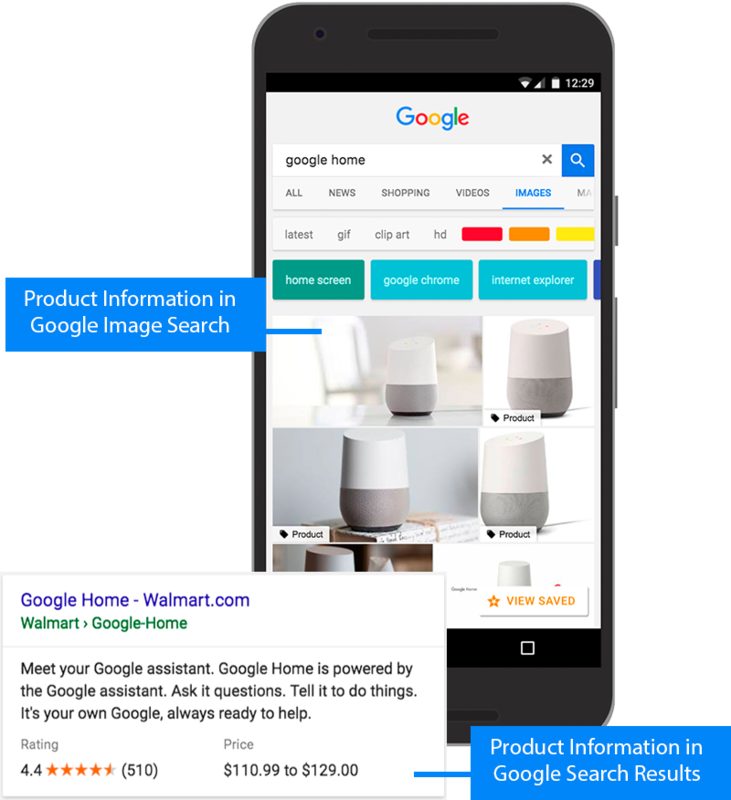 Product markup enables a badge on the image in mobile image search results, which can encourage more users to click your content. Use markup for a specific product, not a category or list of products. For example, “shoes in our shop” is not a specific product. See also our structured data guidelines for multiple entities on the same page. Adult-related products are not supported. Reviewer’s name needs to be a valid name for a Person or Team For example, "James Smith" or"CNET Reviewers." By contrast, "50% off on Black Friday" is invalid. To show your product information in the rich image viewer: Include the name, image, price, and priceCurrency properties. To show your product information in the Related Items feature: Include the name, image, price, priceCurrency, and availability properties. The lowest price of all offers available. Floating point number. The currency used to describe the product price, in three-letter ISO 4217 format. The highest price of all offers available. Floating point number. The number of offers for the product. Value is taken from a constrained list of options, expressed in markup using URL links. Google also understands their short names (for example InStock or OutOfStock, without the full URL scope.) This property is required for the Related Items feature in Google Images and is recommended for Google Search. The price of the product. Follow schema.org usage guidelines. The item being sold. Typically, this includes a nested product, but it can also contain other item types or free text. The date (in ISO 8601 date format) after which the price will no longer be available. Your product snippet may not display if the priceValidUtil property indicates a past date. A URL to the product web page (that includes the Offer). The URL of a product photo. Pictures clearly showing the product (for example, against a white background) are preferred. This property is required for Google Images and recommended for Google Search. A nested aggregateRating of the product. An offer to sell the product. Includes a nested Offer or AggregateOffer. A nested Review of the product. Follow the Review snippet guidelines and the list of required and recommended review properties. Include all applicable global identifiers; these are described at schema.org/Product.